This one is for all the dog lovers out there! If you’re not a dog person this might not be very exciting for you, but if you are, oh my goodness, you are going to die. Or you know, at least go book a ticket to Lapland. Every year Danielle and I take a trip together, and last year I decided to add to that tradition: now every year Danielle and I plan a trip somewhere warm, which I then sneakily hijack into a trip somewhere frozen. Last year it was Russia, so this year of course I had to drag her to the Arctic! Okay it wasn’t quite like that. I’ve been trying to get Danielle to Norway for years but the girl hates the cold, but my just having moved to the north finally convinced her to pay me a visit. And then I’ll be visiting her in New York/Ohio/Cuba for her spring break – totally fair, right? I decided to take this as an opportunity to finally change Danielle’s mind about cold countries, so I needed to make our itinerary epic. I told her to fly into Narvik, where I’d meet her with my car (guys, I bought a car! ), and then we could visit some of my favorite northern spots + get a chance to see the Northern Lights, after which we’d make our way down to my home in Mosjøen. 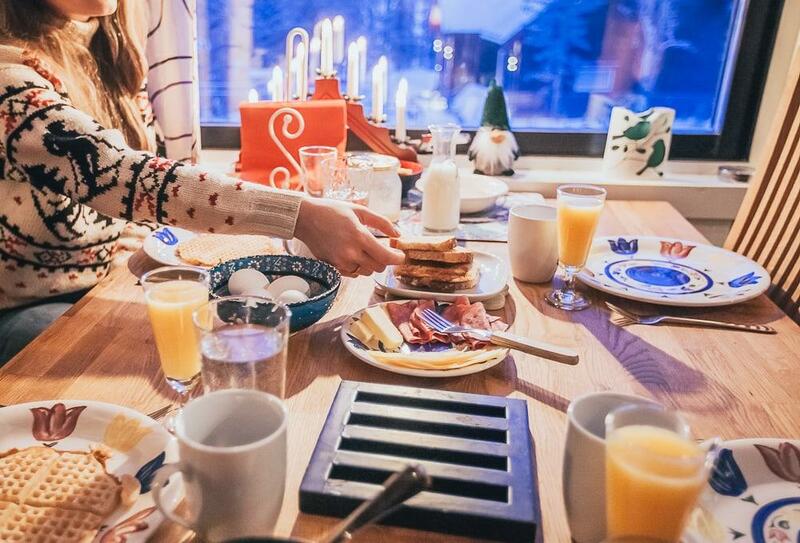 Originally I had thought we could base ourselves in Narvik and then drive over to Abisko if we needed clearer skies, but then I started looking at Airbnb listings across the border and came across this “Husky Home with Breakfast & Sauna” in Kiruna. 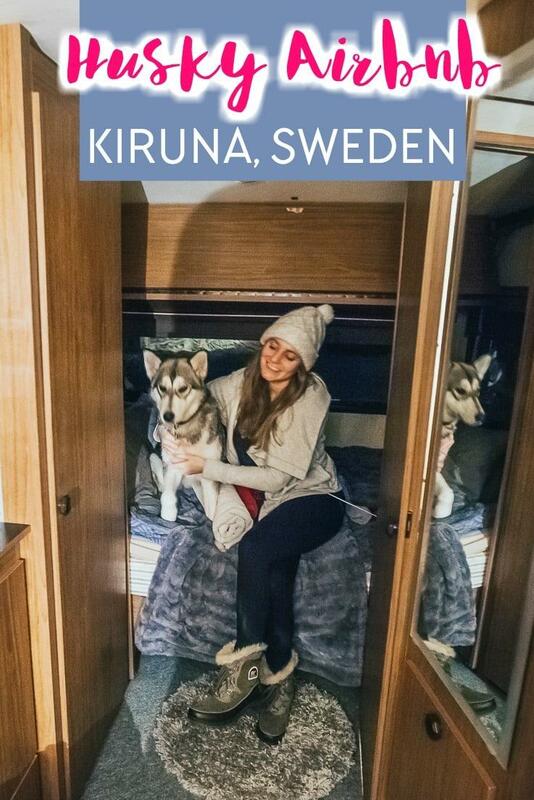 The photo indicated a caravan, not a kennel, owned by two arctic tour guides who also happen to have a pack of huskies. So I wrote to them and asked if we’d maybe get to spend some time with their huskies, and Per responded all casually saying that sure, we could feed and play with the huskies, and if we wanted we could bring one of them into the caravan to sleep with us at night. Now, you might think I’m obsessed with dogs, but Danielle takes it to a whole nother level. I even had to stop following her Instagram stories for a while when she was volunteering at a dog shelter because I was so tempted to move to NYC to rescue one of the adorable pups she kept posting photos of (and yes, I’m one of those people who call 8-year-old dogs puppies sorry). It was too late to clear our whole schedule to spend ten days with the huskies, so I booked us in for two nights instead. We arrived late in the evening on the first night, and after Per showed us around and fed the dogs he chose Hildur to come into the caravan with us. Side note: my car is now named Hildur. And then the next night we had Hildur’s mother Quannik. I was impressed by how well both dogs slept – I had sort of expected them both to be up at 5 am wanting outside, but I guess the thing about working dogs is that they actually need to sleep at night since they’re like, not sleeping all day like every pet dog I’ve had. And they were both the sweetest. 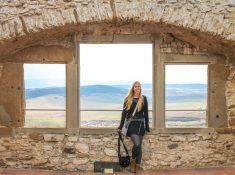 Like my heart hurts a little just writing about them – I want to go back! 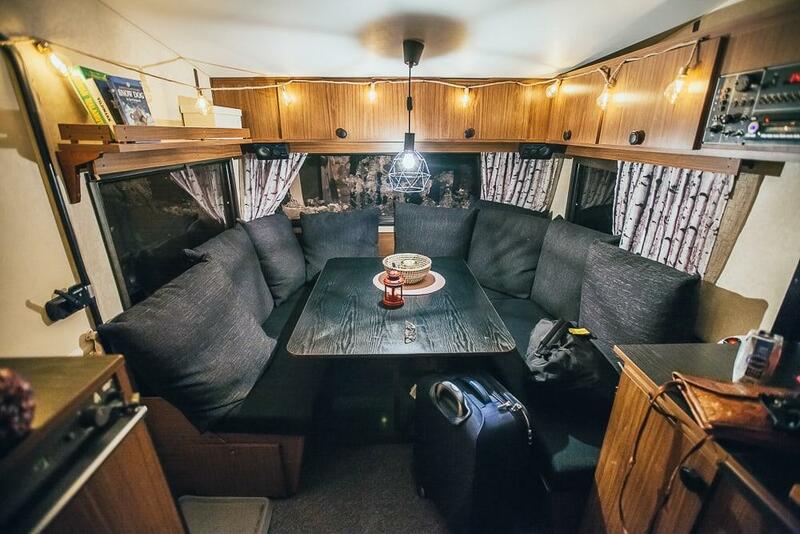 Of course you don’t have to invite a husky into the caravan with you at night. 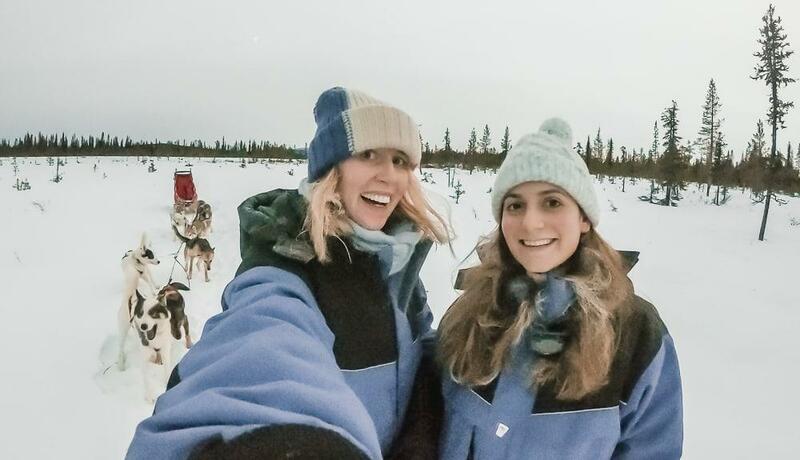 Even if you’re not quite as obsessed with dogs as Danielle and I are, this is such a great place to stay in Swedish Lapland. And yes, I paid for this stay myself – this isn’t sponsored. I do think you’ll have a better time if you can rent a car, as then you’ll be able to explore a lot more, but I believe Per and Jenni can also help arrange transport for you if you don’t rent a car. Though I’ll also be sharing our itinerary soon if you want to do our exact Norway/Sweden road trip. Per and Jenni’s place is right on a frozen lake, which is perfect for dogsledding and cross country skiing – we did both with them. The husky sledding especially was so much fun, and I loved that they only have two sleds so it feels small and personal. Danielle and I both took turns driving the sled and I don’t know when I’ve laughed so much. Plus the route we took through the forest was stunning (I mean, stunning for Sweden). Unfortunately I didn’t quite manage to capture that with my GoPro, haha. The next day Danielle and I were closer to town and a husky sled tour from a big tour company rode by. 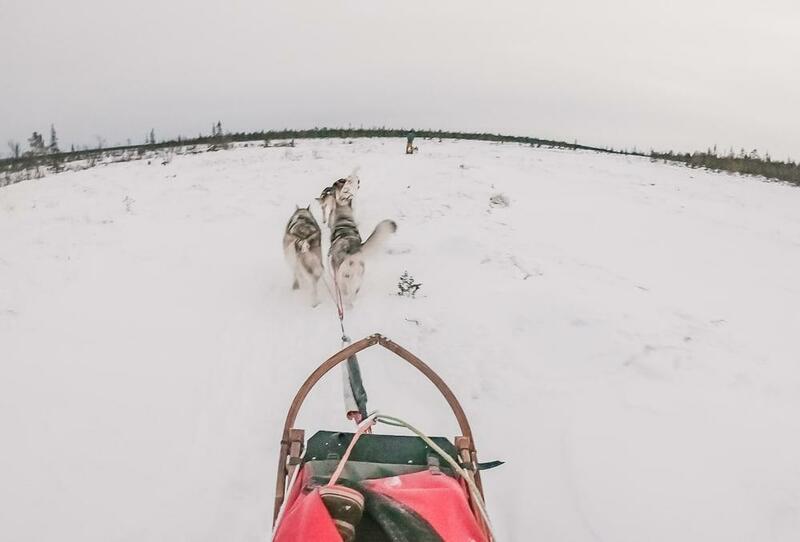 There were several people on each sled and the sleds were driven by guides and Danielle and I looked at each other all smug because our experience seemed so much more personal and fun. Plus I’d always try to go with family-run husky tours, as the huskies will usually be treated the best. I wish we could have stayed longer and done more here! They have a few activities listed here on Airbnb, but you can also ask them to arrange something specific for you when you’re making you’re booking, which you can do here. And you can also arrange tours with them even if you’re staying somewhere else. Oh and if this is your first time using Airbnb you can get a discount by signing up here. They were telling us that for adventurous people they offer a tour where they go out in the wilderness and build a snow cave to sleep in at night. Or they also have a tour that includes a snowmobile trip to a lavvu tent, if sleeping in a snow cave doesn’t sound appealing. But Danielle and I stuck with the caravan and it was perfect. It’s really warm and cozy, and then they have a separate sauna building for showering at night. And of course there’s no better way to warm up after a day out in the snow than in a sauna! They also serve breakfast in their home in the morning. The breakfast is fantastic, but also I loved getting a small glimpse into their life in the Arctic. Per and Jenni are both eight feet tall, Per is Swedish while Jenni is Finnish, and they have the cutest baby boy. Staying with them sort of made me want to move up north and get a pack of huskies. Wait, should I?? It was so hard to leave, and in fact if they hadn’t had new guests arriving that day I probably would have found a way to change our itinerary and stay here longer. Now I just need to find an Airbnb near Mosjøen that comes with a husky. Like, that should definitely just be a thing. Or maybe I should drive back up to Kiruna for another visit, especially as at the end of January ONE OF THEIR DOGS HAD PUPPIES! So if you happen to be going to Lapland anytime soon, definitely go and visit the puppies! And take lots of photos and send them to me. Until then I’ll just be stalking their Instagram account. 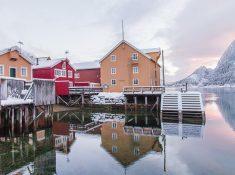 Previous Post: « A One Week Northern Norway Winter Itinerary – Crafted by the Experts! 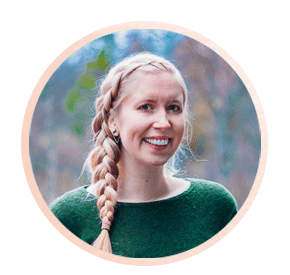 Now in love with your blog and reading about Norway! So gorgeous. You have a magical ability to make me want to go to places I’d never considered/heard of – I’d always had Norway on my list but you’ve managed to add the Finnish and Swedish Laplands as well. The far north looks incredible. Haha they are all amazing and definitely worth the trip! I can’t help clicking after reading your blog post title. 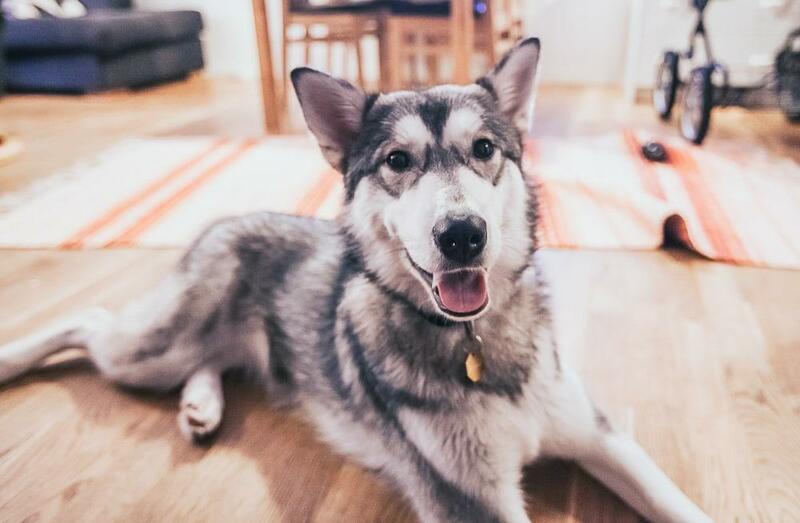 Staying with huskies? No way! My dog-loving heart can’t miss to read this! I can’t stop smiling while reading your post. I can feel the passion and excitement from here. (I can’t blame you. 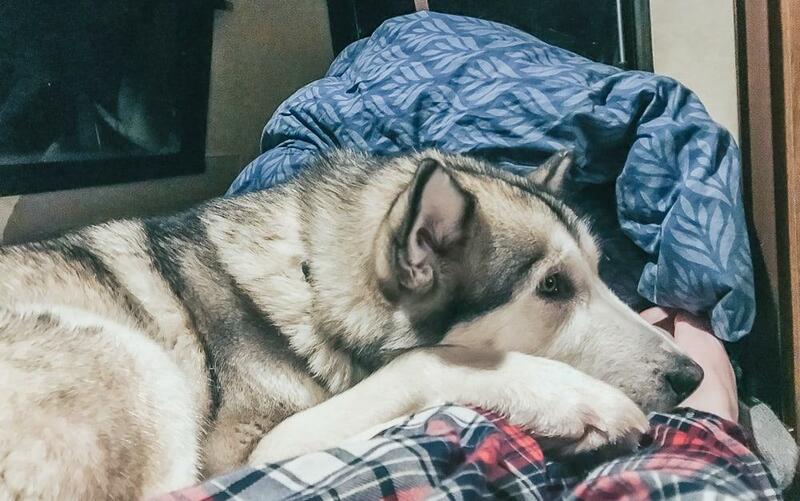 Dogs are just <3) Amazing pictures, the place you booked feels cozy. Per and Jenni seems really nice people! Saving this for later! If you love dogs you will loooove it here! Also, what colour is your Hildur? And she's a girl, right? Yes! My Hildur is silver, just like the dog Hildur. I’ll have to get a picture of her the next time I’m out taking photos.